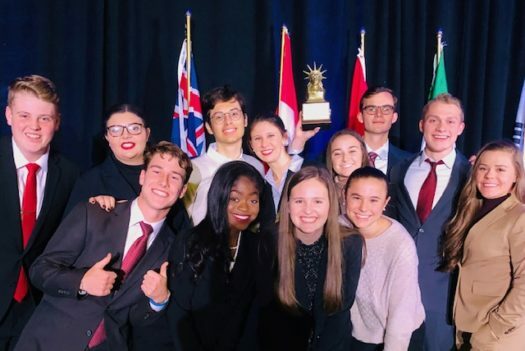 LCS Mock Trial team had an extraordinary experience at the Mock Trial World Championship in New York. The team had some amazing adventures that could not have been anticipated, and LCS is so grateful for your prayers for these students. The team is celebrating a 6th place overall finish out of a field of forty teams from eight countries. They ended with a record of six wins and two losses. The team is coached by the amazing Chasity Branham with assistance from Judge-elect Melissa Gravitt. The students on this team are: Abby Branham, Ama Fosu, Sam Riley, Camryn Wineinger, Keaton Walding, Trent Curtis, Faith Nagy, Annie Bolter, Lucy Bolter, Emily Branham, Jace Gravitt and Hunter Patteson.